The setting is very real. It feels real to its very core, even for those of us who have never been to West Texas and don’t necessarily know what it’s like, this is what it’s like to these characters. The first bank consists of one teller and one manager who hasn’t yet arrived. The brothers are decked out in black ski masks and unidentifying clothes and guns. They want cash, just empty out the drawers, and small bills will be fine. Ben Foster and Chris Pine in HELL OR HIGH WATER. Images courtesy of VVS Films. How they rob the banks is a very small part of this movie. The richly drawn characters and the world they live in, and most importantly, their plan, really drives this film forward. Pine’s performance as the younger Toby is the perfect mix of good, family boy with sparkling blue eyes, and disillusioned bad boy who fears there’s no way out of the world he was born into. With only his eyes peeking out of his black ski mask, you can clearly see the fear he has; he is scared of what they have gotten themselves into. Either it’s going to undo him, or he’s going to undo it. Foster’s Tanner is the opposite. The older brother who has been out of jail for a year, and as he says, it has been very difficult not getting thrown right back in. He’s always looking for a fight, he loves the adventure, and he’s likely to up the ante of their plan. The core of what makes Hell or High Water a good movie, is the story. The brothers have a plan to rob banks, and the audience gets to figure out what exactly their plan is. On the flip side we have a pair of Texas Rangers assigned to investigate the recent robberies, and the audience is right alongside them trying to figure out how to track them down, and if they’re going to succeed. And the story is constantly moving forward, all the way to a teasingly good ending. 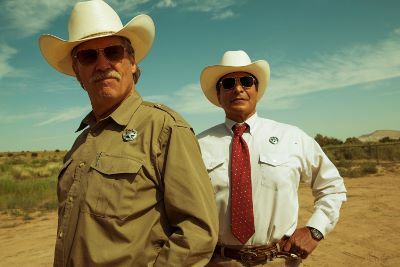 Jeff Bridges and Gil Birmingham in HELL OR HIGH WATER. Images courtesy of VVS Films. There’s also a lot of humour in the movie. Jeff Bridges stars as the about-to-retire Marcus who’s grumbling because he’s being forced to retire, grumbling because he doesn’t like getting old, and grumbling probably because he always has. He makes many racially-insensitive jokes to his mild-mannered half-Mexcan, half-Native American partner. He makes jokes when things don’t go his way in the case, or when they surprisingly do, and he makes jokes directed at waitresses who just might develop a crush on the devastatingly handsome Toby. It’s Chris Pine’s Toby who grounds this film into something the audience cares about. His mother has died, he’s been left with only debt, he’s divorced, and he’s a father to two sons that he doesn’t get to see anymore. He’s in this for more than just robbing banks. Now he’s a criminal too, but an interesting one. 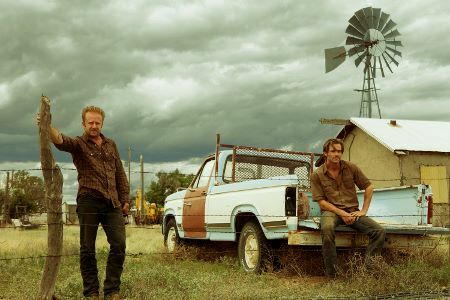 It’s the slow-burning pace, with action always just around the corner, the lived-in cinematography of rural Texas, the characters who belong there, and the country music score that help turn Hell or High Water into a mesmerizing journey. The Place Beyond the Pines (2012) - A story of trashy criminals and dirty cops evolving into one about fathers and sons and life. Killer Joe (2011) - Perverted maturity and twisted humour take us through Texas and the chillingly evil plot.